Shelley here, with a Sweet Treat, just in time for Valentine's Day! This is my entry for the Design Team Challenge! I've made a few Valentine's Day Magnets, and decorated a jar to put a few treats in! For the jar, I took a doilly and sprayed it with Shimmering Mist. After it dried, I covered the inside metal lid, and put the ring around it. These fabulous cupcakes were made with the "Delightful Cupcakes" Die-Namites Die and some thin metal. They look good enough to eat! Here are the magnet-valentines I made! I started with chipboard pieces. On the scalloped piece, I used Inka Gold in "Lava Red". This provided a nice base to start with! For the top chipboard piece, I used a piece of Cotswald Manor paper. 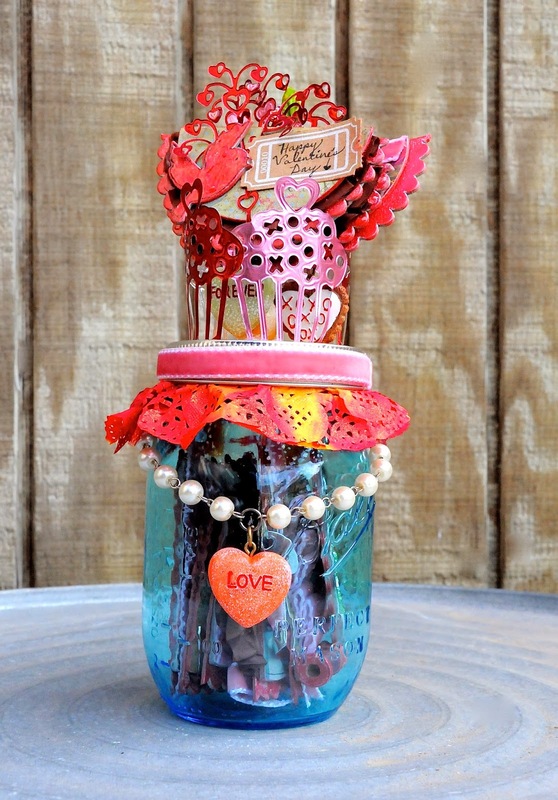 The "Heart Bouquet" is another awesome die from Die-Namites! To give the little chipboard bird a little bit of texture, I used the Viva Magic Transparent Pearl Pen. I glued a piece of magnet on the back of the piece. So, instead of giving a little Valentine's Day card, I will give my Valentines a little magnet that will have them thinking of me just a little bit longer! On this magnet, I used the "Delightful Cupcakes" diecut again! I cut it in two different colors of metal, allowing me to have the cut-out parts in a different color, and then I glued them on! I hope you enjoyed my project! Please stop back in regularly to see what wonderful things The Crafty Scrapper has to share!! I love this!! A very clever idea!